You will not receive a better education at a historically black college or university (HBCU) than Florida A&M. Last month, U.S. News & World Report’s Best Colleges 2018 study named FAMU the sixth-best HBCU in the country — one spot higher than its 2017 ranking — and defended its spot as the top-ranked public institution. “I wanted to attend an HBCU, and I wanted to go to the best one, and that’s [Florida A&M],” Angie Meus, a 2013 alumna, said. But as the lone unbiased person writing about HBCU homecomings — I went to the University of Maryland, College Park — here’s why public or private aside, FAMU has the best HBCU homecoming in all of the land. As the Rattlers celebrate their school’s 130th birthday — founded on Oct. 3, 1887 — the university dubbed 2017’s homecoming a FAMUly Reunion as Florida A&M family past and present celebrate 130 years. And it’s ironic that would be the theme for the homecoming because that’s what Meus said she loved the most about FAMU’s homecoming experience. “We just know how to have a good time,” Meus, an associate producer at Houston’s NBC affiliate KPRC, said. “No matter how long you stayed there, or what you majored in, it’s a big family reunion. The weeklong slate of activities included the coronation for Mr. & Miss FAMU, the Greek step show, a comedy show performance, a homecoming concert that featured 2 Chainz and 21 Savage, a fashion show, a performance from the famed Marching 100 and much more. The homecoming football game featured the Rattlers against North Carolina A&T. And all those things to do are another strength Meus pointed out. Besides that, everyone knows what it is when it comes to the Marching 100, as its body of work speaks for itself. “I really, really loved the comedy show,” she said. “There’s always a lot of vendors out with a lot of good food, and lots of different events. There’s something for everybody. North Carolina’s A&T Blue and Gold Machine makes their way along the parade route. FAMU’s Marching 100 takes the field. Donovan Dooley breaks down why North Carolina A&T State University’s Greatest Homecoming on Earth reigns supreme, but you ain’t convincing me. The rain was spotty, but the Aggie Pride was not in Greensboro, North Carolina, on Oct. 7 at the Greatest Homecoming on Earth (GHOE). Current North Carolina students partied with their friends from neighboring HBCUs, while alumni tailgated and reminisced about their times in Aggieland. Some were even gracious enough to provide food to some hungry N.C. A&T students. Alums even participated in the football game, where the Aggies spanked Delaware State, 44-3. Former N. C. A&T cheerleaders and Golden Delight Auxiliary returned to the spotlight to perform with their current respective squads. Even prospective students took part in the fun. Saturday was perfectly designed for everyone to enjoy themselves because the events earlier in the week were geared to current students, while the weekend was for everybody. The pep rally on Thursday in Corbett Sports Center was one of the most live events of the week. Students packed into the basketball arena and you could feel the excitement of GHOE in the atmosphere. Songs by popular hip-hop artists such as 21 Savage and Gucci Mane were played over the loud speakers at the pep rally. Practically every student in the stands sang along and danced to every lyric. Students took this same energy to the Friday night Greek step show at the Greensboro Coliseum. They were eager to see who would come out victorious after the Phi Beta Sigmas’ victory from the year before. NCAT Dancers perform and the FAMU percussions hit the field. As this year’s show concluded, it was obvious that the Sigmas would repeat as step show champions. They performed a step routine with a tribute to the old-school music group, New Edition. Surprisingly, the most disappointing performance of the night came from Omega Psi Phi. The Ques’ lackluster performance was the talk of the show until the Sigmas came on stage. As a result, students debated whether there would be a power shift among the Greeks on campus from the Ques to the Sigmas because of their performance. But 24 hours later everyone forgot about the step show. After Saturday’s football game, there was one last event and it involved one of the hottest names in hip-hop right now, Migos. 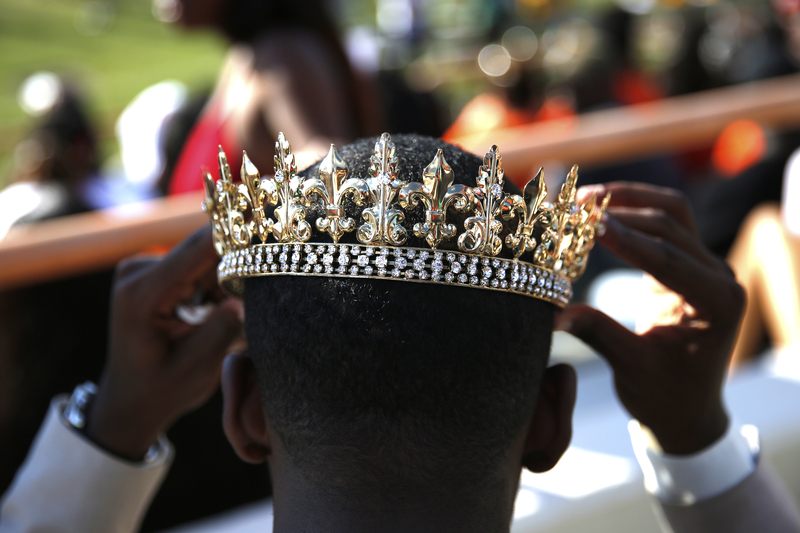 Jordan Sealey, 21, adjusts his crown during Florida A&M University’s homecoming game against North Carolina A&T at Bragg Memorial Stadium in Tallahassee, Fla., Oct. 14, 2017. Once Migos took their final bow, GHOE 2017 was officially over and the notorious weeklong event cemented its reputation as the best HBCU homecoming. Take the challenge on our Twitter feed @TheUndefeated and try to prove us wrong by using the #bestHBCUHomecoming and tell us whose homecoming you think is the most live. The Undefeated’s Rhiannon Walker and Rhoden Fellow Donovan Dooley make their cases right here.